MultiBrief: Wellness trends in the workplace: Do they stack up? According to the recent Workplace Wellness 2017 Survey Report conducted by the International Foundation of Employee Benefit Plans, up to 75 percent of employers offer some type of wellness program to employees. The primary goal of these programs is not only to help maintain a healthy workforce, but also to reduce healthcare costs, boost attendance, and increase productivity. The survey revealed that common wellness trends for 2017 include coverage for chiropractic services, sponsoring wellness events and competitions, providing standing desks and fitness trackers, as well as offering healthier food in cafeterias and vending machines. These initiatives and others like them that attempt to improve worker well-being may seem great in theory, but are they actually improving employee health, productivity, and attendance? Offering additional healthcare services as part of an employee wellness program, such as chiropractic care, free flu shots, or a flexible health spending account, can help workers offset the cost of some of these services. As healthcare becomes increasingly more expensive, workers are asked to contribute a greater percentage of their salaries to maintain their health insurance. This may lead to employees not seeking other types of care they may need for less serious ailments. Overall, any additional share of cost that goes towards healthcare spending can help employees get the services they need to stay healthy. Community health fairs, wellness challenges, or workshops on health-related topics can be a great way to promote health and well-being in the workplace. However, even for workplaces that offer these types of programs, only 60 percent of employees are aware they even exist, according to a 2014 Gallup study. Of those workers who are aware of the programs, only 40 percent actually participate. There are several reasons for low participation in wellness programs. Many employees feel they are not provided enough time or support to attend these types of programs. Also, many of these programs focus on physical health alone and do not take a holistic approach by including mental or financial health information. Companies that have been most successful at implementing wellness programs have made an effort to create an overall culture of wellness in the workplace, including significant participation and support from management, as well as attractive incentives for participation. Looking ahead, it’s important to treat wellness programs from the point of view of overall well-being, including offering career development initiatives and a focus on mental health programs. Studies have shown that hours spent sitting in one spot can be detrimental to your physical health. Furthermore, strict, in-office schedules can interfere with work-life balance. Offering workers flexible schedules and the ability to work from home can allow employees to be more active during the day, managing their own health and work tasks at their own pace. A healthier work environment can include a variety of modifications to the office culture, such as healthier food options, standing desks, and the encouragement from management to engage in more physical activity throughout the day. 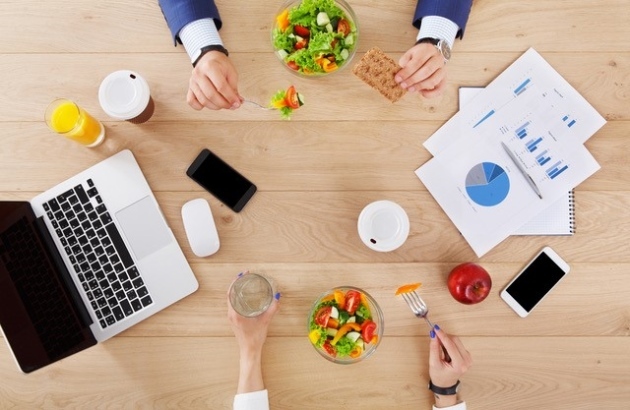 A 2012 European review of 17 different studies revealed that the availability and promotion of healthy food in the workplace can have an impact on improving employee health. A 2014 study found that standing desks helped improve blood glucose after meals and increased calorie burn by an average of 174 calories, compared to employees who didn't stand. Workplace wellness initiatives do seem to benefit employees if they are implemented in a thoughtful way that holistically addresses the primary well-being concerns of the specific workers in the company. Since these initiatives cost money to maintain, they must be targeted, regularly audited for effectiveness, and supported by an overall culture of corporate wellness. Ana Reisdorf is a registered dietician and writer for Walgreens, who enjoys sharing tips on how to stick to a healthy lifestyle whether at home or at the office. You can find more information about vitamins to supplement a nutritious diet at Walgreens.com.